Good and happy news for Kontakt 5 Player users for this free instrument libraries provided by Weltmeister Royal Standart Cmusic Instrument free libraries for kontakt 5 player. This library for kontakt provides you with various instrument samples like drum, bass, guitar, and manymore. 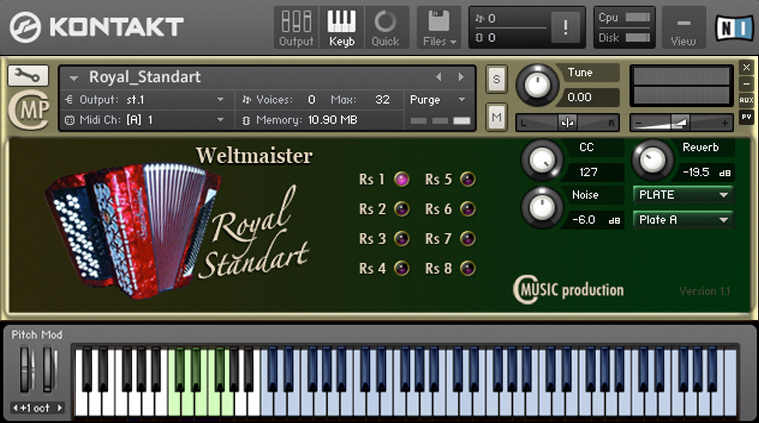 According to some review about this free libraries for kontakt, the Weltmeister Royal Standart, the button accordion library is very easy to use. This instrument maker is designed for those who want to create music instantly. As we all digital music makers know that making music is easy so long as we have the fundamental skills to craft one. Instant music maker software, that is what I can say about this free library for kontakt. If you have a decent ability in playing keyboard or organ, then making music is just a step away. Its single-layer samples contain depth and character of voicing. The Velocity is regulated by Modulation (CC1), using a filter (LP1) that continuously varies the timbre as the Modulation values change. In this way, a wealth of “hidden” accents can be added to your playing style.